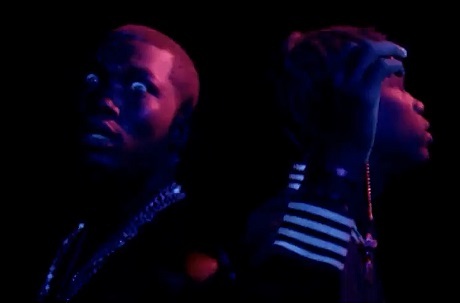 Despite coming off of Meek Mill's Dreamchasers 3 mixtape, the video for its "I'm Leanin'" comes across as a freaky, black light-lit nightmare in the club. Milly is especially aggro in the video, bugging out his eyes every time the camera comes near him. Joining him at the party is Travi$ Scott, who spits his verse with a beastly pitch-shifted double vocal, and someone in a creepy animal mask. They puff strong, pour Ciroc and Monster energy drinks, munch on money, and just plain bug out over the course of the video. You can check out the unnerving results down below.